...when economic institutions take steps towards greater inclusivity — which has happened many times in history and is exactly what happened in China starting in 1978 — this can usher a rapid period of economic growth. Where political institutions come in is that inclusive economic institutions can emerge and encourage growth in the short run but cannot survive in the long run under extractive political institutions. It is for this reason that the rapid growth of China over the last three decades isn’t an exception to our theory. If China manages to continue to grow for several more decades and reach levels of income per capita comparable to those of the United States or Germany while still austerely authoritarian and politically extractive, that would be an exception to our theory. This is exactly what we argue in Chapter 15 as well as pointing out why the transition from extractive to more inclusive political institutions in China will be difficult. We go to pains in the book to emphasize that electoral democracy isn’t the same as inclusive political institutions. This becomes particularly binding when it comes to India. India has been democratic since its independence, but in the same way that regular elections since 1929 don’t make Mexico under PRI control an inclusive society, Congress-dominated democratic politics of India doesn’t make India inclusive. Perhaps it’s then no surprise that major economic reforms in India started when the Congress Party faced serious political competition. 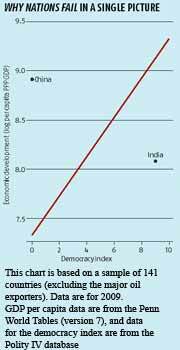 In fact, the quality of democracy in India remains very low.